Concessions continue as Ferndale Schools tries to negotiate their way out of a $2.4 million budget shortfall by asking employees for temporary pay cuts. Superintendent Gary Meier and Director of Finance Maureen Adams accepted 7.38% reductions in their contracts for the current fiscal year, and the administrator’s union (AFSA) agreed to the same level of cuts. This matches a 7.38% concession taken by the UAW last month. In the case of the Superintendent, a $14,023.70 reduction will be taken in the form of a 20% (2 days x per diem) reduction in the remaining 9 pay periods, with the final pay adjusting the deduction up or down so that the full $14,023.70 is subtracted. Meijer’s contract goes until June 30, 2016. The Director of Finance contract amendment specifies the 7.38% cut at $6,996.68, which will be realized by her assuming the board’s share of health insurance premiums, payable in 9 equal installments over the remaining 9 pays in the current fiscal year. Two other small adjustments, totaling about $900 are added to realize the full cut. “In addition, both parties agree that the contract’s provisions on accessibility and full time effort remain the same, as do the board’s expectations of performance,” O’Donnell said. The administrator’s union (AFSA) ratified, and the board approved, a contract amendment that also effects a 7.38% salary reduction. The reduction fully eliminates two stipends that would have been paid in the 2014-15 school year, which equals about 4% of salary costs for the unit. The remaining amount is realized by taking a 3.45% reduction of annual salary to be subtracted from February through June pays. The percentage deducted will be approximately 10% since there are only 9 pay periods left to recoup a full year of 3.45%. That reduction is roughly equal to 8 furlough days, which AFSA employees will take over the next 17 months. Those days are subject to the approval of the superintendent and will avoid any days that students are in school. The agreement also changes the insurance offering to a high deductible HSA plan, which reduces employee premium contributions. On Jan. 13, the Board approved a contract with UAW Local 889, which has 48 members. 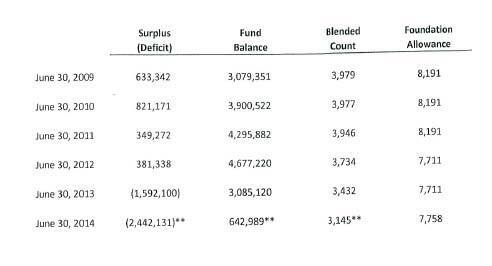 The agreement, which provided the district with $73,710 in immediate budgetary relief, approved a 7.38% wage reduction from January 1 to June 30, 2014. Effective July 1, 2014, a 4% wage reduction of the original (July 1, 2013) base rate will go into effect. Step increases will also begin July 1, 2014. As a result of these two changes, as of July 1, 2014, UAW employees will be returned to their base July 1, 2013 rate. Language was also included in the contract that triggers employee wage increases if enrollment and/or the state foundation allowance experience an increase. Additional compensation will also be provided if a pending pupil accounting appeal is found in favor of the district. Two main factors have affected the budget in recent years. From 2009- 2014 the per pupil foundational allowance from the State has gone from $8,191 to $7,758. On top of that, enrollment has declined in the same years from 3,979 to 3,145. This year the School Board originally budgeted for 350 more students than they ended up having. Requests for cuts sparked demonstrations outside the Jan. 13 special School Board meeting. The American Federation of State, County and Municipal Employees [AFSCME], Ferndale Association of Educational Secretaries, and Ferndale Education Association were among those who took part in the demonstrations. They raised concerns and alternatives to the cuts, and members have been attending School Board meetings since to share their stories and plead for alternatives to cuts. In addition to seeking wage concessions, Board Members are hoping to make an impact politically. Along with parents and teachers, they are planning an advocacy trip to Lansing on Feb. 19 to protest cuts to the foundational allowance. More information on that trip is available at http://oaklandcounty115.com/2014/01/31/education-advocacy-trip-to-lansing-planned-for-feb-19/.